The National Football Foundation (NFF) and College Hall of Fame announced today that University of Oklahoma Director of Athletics Joe Castiglione has been named the 2013 recipient of the John L. Toner Award. The Toner Award is presented annually by the NFF to an athletic director who has demonstrated superior administrative abilities and shown outstanding dedication to college athletics and particularly college football. “Since Joe’s hire 15 years ago, Oklahoma has dominated the football and athletics landscape with the Sooners experiencing extraordinary success as a perennial national power," said NFF President and CEO Steve Hatchell. "The Sooners have a rich football history, and the success of the team would not be possible without Joe’s support and leadership. His accomplishments place him the vanguard of his profession and truly worthy of this prestigious honor." Hired by OU President David Boren, Castiglione arrived in Norman in April 1998, and he wasted no time in achieving success in the program’s 21 sports. 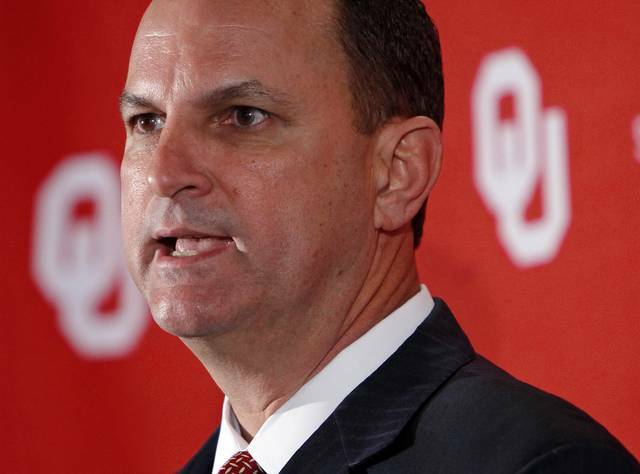 By December of 1998, Castiglione had secured Bob Stoops as the Sooners new football coach. Under their watch during the past 15 years, the Oklahoma football team has played in four BCS National Championship Games, including a victory in 2000, which capped a perfect 13-0 season; collected eight Big 12 Conference titles; produced two Heisman Trophy winners; had eight Sooner players and one coach inducted into the College Football Hall of Fame; and produced one NFF National Scholar-Athlete. He has also effectively managed Oklahoma’s budget, making Oklahoma one of the few Division I programs in the country that is completely self-sustaining and annually contributing more than an $8 million surplus to OU’s Academic Budget. Facility additions and renovations at the school have been funded entirely by private donations. Castiglione played an instrumental role in the largest fund-raising effort in OU athletics history, raising more than $330 million for facility improvements, a student housing center, multiple scholarship endowments and numerous other major projects. For his efforts, Castiglione was named the 2009 National Athletic Director of the Year by the Sports Business Journal. He was the 2012 winner of the Carl Maddox Sports Management Award, as selected by the United States Sports Academy, as well as the 2004 Bobby Dodd Foundation Athletics Director of the Year. Castiglione was inducted into the National Association of Collegiate Marketing Administrators Hall of Fame in 2003. His peers named him the National Association of Collegiate Directors of Athletics (NACDA) Central Region AD of the Year in 2000. OU was also tabbed the 2007 PRISM Award winner, presented by the School of Sports Management at the University of Massachusetts, making the Oklahoma only the second Division I winner in the award’s history. In 2007, Castiglione earned a master’s of education from Oklahoma and has served as an adjunct professor in the College of Education where he teaches graduate classes in marketing, development and leadership in higher education. Prior to joining Oklahoma, Castiglione enjoyed a 17-year tenure at the University of Missouri, spending the last five years as athletics director. A 1979 graduate of Maryland, Castiglione began his career as sports promotions director at Rice University before serving one year as director of athletic fundraising at Georgetown. Castiglione serves on numerous athletic boards including the National Football Foundation and College Football Hall of Fame, the NCAA Bowl Licensing Committee, the NCAA Division I Men’s Basketball Committee, the Gatorade Collegiate Advisory Board, the United States Olympic Committee Athlete Career and Education Strategic Working Group. He is also a three-time chair of the Big 12 Board of Athletics Directors and was president of both the FBS Athletic Directors Association and NACDA. The Ft. Lauderdale, Fla., native and his wife, Kristen, have two sons, Joseph Robert, Jr. and Jonathan Edmund. Castiglione will be honored at the 56th NFF Annual Awards Dinner on December 10 at the Waldorf-Astoria in New York City. Castiglione will accept his award alongside the recipients of the other NFF Major Award, including the NFF Gold Medal, Distinguished American Award, Outstanding Contribution to Amateur Football Award, and the Chris Schenkel Award for excellence in broadcasting, which will all be announced in the coming weeks.